Zeuge retained the WBA regular title on a technical decision over mandatory challenger Isaac Ekpo. Zeuge was badly cut after a head clash in the third and ringside physician Walter Wagner called it off in the fifth. Zeuge was then ahead 49-46, 49-47 and 48-47. Gualtieri is trained by Graciano Rocchigiani. Haapoja won the vacant EU title on scores of 117-111 twice and 119-109. Kourbanov won the vacant EU superfeather title on scores of 115-113 twice and 114-114. 40-35 twice and 39-37. Janjic down in the third. 39-38 Hietalä, 38-38 and 39-38 Radulovic. 95-94, 96-93 and 97-92. Urvanov was down 2.37 of the tenth. 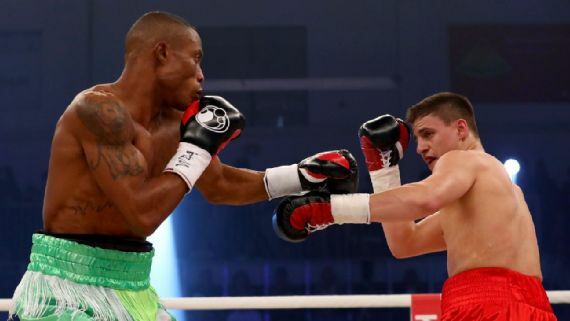 Crenz was floored late in the first, IBF Int´l title. Sempewo floored at 0.50, stopped 1.32. 77-75 and 79-73 Miliusha and 77-75 Nikitin. Resetar cut and it was stopped. Billed as for PRO-BOX title (??). 39-38 and 39-37 Dukaev, 39-38 Ivanov. Kovalenko was floored in the first and second. vacant WBFed female lightweight title. vacant UBO Int´l 168 lb title scored 99-93, 98-92 and 99-92.